In his first official engagement as Head of the European Union Advisory Mission Ukraine (EUAM), Mr Kęstutis Lančinskas today spoke at a ceremony of the National Police in Bila Tserkva, where a model policing project already developed in Sambir, Lviv region, was officially launched. Participating in the ceremony with Mr Lančinskas were Prime Minister Arseniy Yatseniuk, the Minister for Internal Affairs, Arsen Avakov, Head of the Delegation of the European Union to Ukraine, Jan Tombinski, and Head of the National Police, Khatia Dekanoidze. “It is through such projects that public confidence in the police is strengthened. Law enforcement officers first and foremost serve the public and not power,” Mr Lančinskas told reporters. “Today we are witnessing a very good example of the impact of reform. Ultimately, reforms should bring tangible benefits to all Ukrainians and meet their expectations. We are glad to help and to share our experiences with our Ukrainian colleagues”. 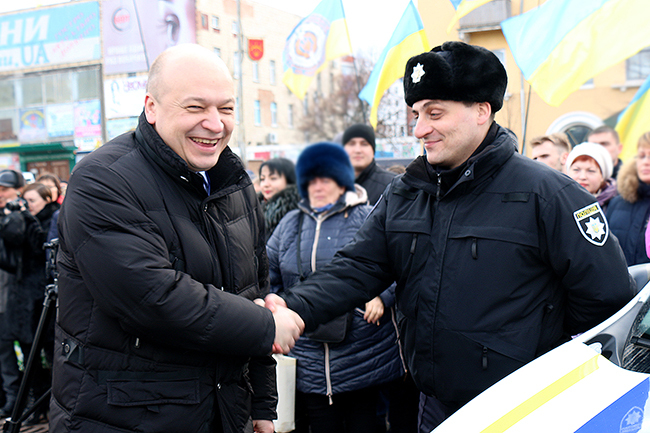 The model policing concept was developed jointly by the Ukrainian National Police and EUAM, and has already achieved results in reducing the response times of police to calls-outs in Sambir, where it was first rolled out last summer. Mr Lančinskas also took the opportunity to inform journalists that a revised EUAM mandate would allow the Mission to build on its support to the Ukrainian civilian security sector. The Mission would now be supporting the implementation of reforms by way of training and projects as well as by providing strategic advice, he said. A Masters graduate of criminal law, Mr Lancinskas became Deputy Police Commissioner General of Lithuania in 2005, before taking over as Chief of Vilnius County Police in January 2009, a position he held until last week. He also worked in several First Secretary roles as part of Lithuania’s diplomatic service during the 1990s, before playing a prominent role in ensuring Lithuania’s European integration, which included eventual EU membership and joining of the Schengen area.